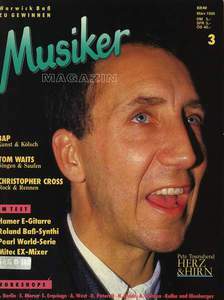 When in March 1986 the first issue of the magazine "Musiker" was on sale, a small group of Cologne musicians, authors, technology experts and guitar freaks took time for a breather for the first time. To establish a new magazine in a market that was previously dominated by the legendary "Fachblatt" was not an easy thing to do - but the first step was successful. And from then on it went uphill. From issue 08/1989 the magazine was called GITARRE & BASS, subtitle: THE MUSICIAN SPECIALIZED MAGAZINE. The recipe for success? Leisure musicians, professionals, newcomers and reactivated instrumentalists provide technical news, test reports, musical tricks & tips and lots of facts about new and legendary acts in a rehearsal room fitting language. 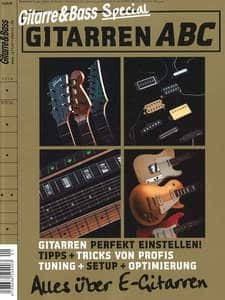 Another reason for the success of the magazine led by Editor & Editor-in-Chief Dieter Roesberg is certainly the broad approach: Gitarre & Bass delivers reports on and interviews with musicians from rock, blues, jazz, metal and pop, as well as articles and contributions to topics such as instrument production, development and history. The musical practice is supported by workshops of competent authors and musicians. The editorial offer is completed by the extensive and up-to-date news & service section with technical information, CD & book reviews, tour & TV appointments, etc. The presentation of vintage instruments has become a further focus in recent years - and a market trend. To recognize developments early, to pick them up and to use them, or even to establish new movements yourself and turn them into trends, you need expertise, groundedness and an emotional connection to the subject matter. Apart from editor Dieter Roesberg, G&B editors Florian Stolpe, Guido Lehmann, Stefan Braunschmidt and Lothar Trampert are not only recognized specialist authors but also musicians and / or hunter & gatherers who have been active in the live and vintage scene for many years and sometimes like to screw on their own instrument or discover a new effects device designer on the web. The common goal is to pass on this enthusiasm for the topic in order to provide technical and musical know-how to young and experienced guitarists and bassists, thus providing impulses for their own music. The openness to different musical styles and gear philosophies has always distinguished Gitarre & Bass clearly from the competitors in the field of music magazines. Gitarre & Bass has accompanied a number of brand and musicians, some of them from their earliest beginnings to worldwide relevance: guitarists Joe Bonamassa, John Scofield, Steve Vai, Jeff Beck, Joe Satriani and Steve Lukather, bands like Toto Smashing Pumpkins, Motörhead or Scorpions, the German soloists Marcus Deml, Michael Sagmeister and Hellmut Hattler, then today with market-leading PRS guitars, mesa / boogie amps, Warwick basses etc. The Line6 Modeler Pod introduced a new technology , which is still evolving in devices from Fractal Audio and Kemper. The presentation of European and German manufacturers, of which Nik Huber, Jens Ritter, Hughes & Kettner, Diezel Amps u.v.m. have also made a name for themselves internationally. 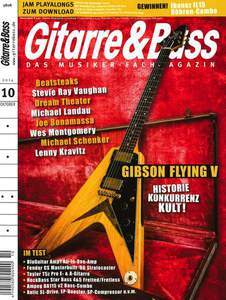 Gitarre & Bass is in Germany, Austria and Switzerland, according to the IVW exam, the music magazine with the widest circulation. Since the beginning of 1997, Gitarre & Bass also presents itself extensively in the world wide web. In addition to processing the editorial contents of the current issues, G&B online offers additional information, tips, links and research options, a comprehensive range of audio samples of the workshops and transcriptions in the magazine, as well as access to selected articles from previous editions and special compilations on important topics. The Jam-Playalongs offer karaoke versions of well-known hits and classics for instrumentalists - which are produced exclusively for each edition by an experienced team of well-known studio musicians and are very successful. Over 360 songs in four to six versions are now available at www.gitarrebass.de. Increased activities in the area of social media have also increased the reach of the brand Gitarre & Bass in the digital world in recent years. Competent blog posts, regular newsletters, and collaborations with events such as the Guitar Summit, the Holy Grail Guitar Show or Tour Presentations by UFO, Toto, Hellmut Hattler, Bernard Allison, Wishbone Ash, Danny Bryant, The Brew, Jackson Browne, Joe Bonamassa, Lynyrd Skynyrd and much more. In addition, they generate presence and new contacts far beyond the print sector. But there has also been a lot done: In recent years, in addition to the monthly publications of the magazine, a number of SPECIALS have been released, such as a Fender Special, a Gibson Special, the Electric Guitar Special, an Ibanez Special and last the Gitarre & Bass guitar ABC for beginners & advanced, with a lot of information, tips & tricks around the instrument of our choice. By the way, the editorial staff of Gitarre & Bass evaluates an average of 3000 emails and letters per month, so that a constant, direct contact and reference to the wishes of the readers is guaranteed. Because the maxim has not changed: It continues to provide a competent, entertaining and inspiring magazine for the great guitarist & bassist scene. BY MUSICIANS FOR MUSICIANS. Appeal to your customers with a 360° strategy! We prioritize advertising with long-lasting effects. And these can only be achieved via a holistic approach on all terminal devices. Studies show that cross-media campaigns boost the willingness to purchase by 32% and heighten interest in a product by 43%. Reach out to our readers in a variety of ways through a monthly print magazine, a daily updated website, daily and weekly newsletters, and six social media channels as well as theme-specific store products.